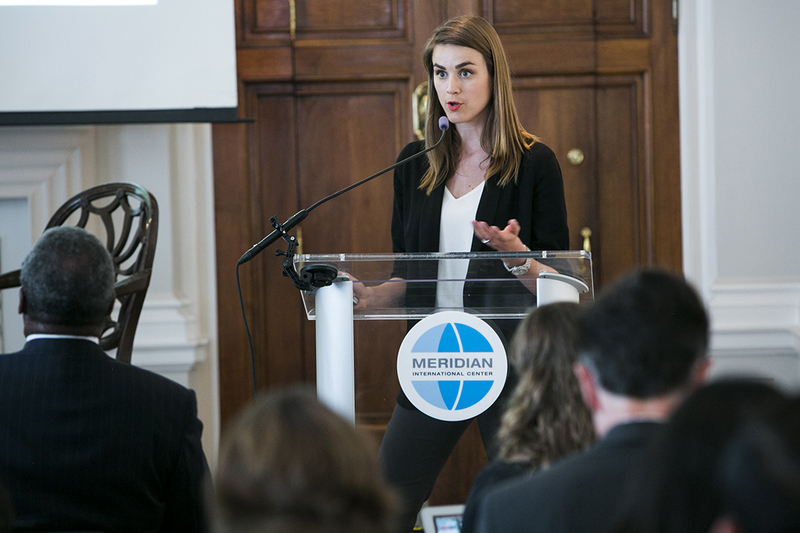 On April 20, 2017, Meridian International Center gathered more than 100 global influencers across foreign embassies, central banks and ministries as well as business, non-governmental organizations and media for “The Digital Opportunity: Reducing Global Poverty through Economic Innovation,” which was the culminating event of The Digital Finance Future series. 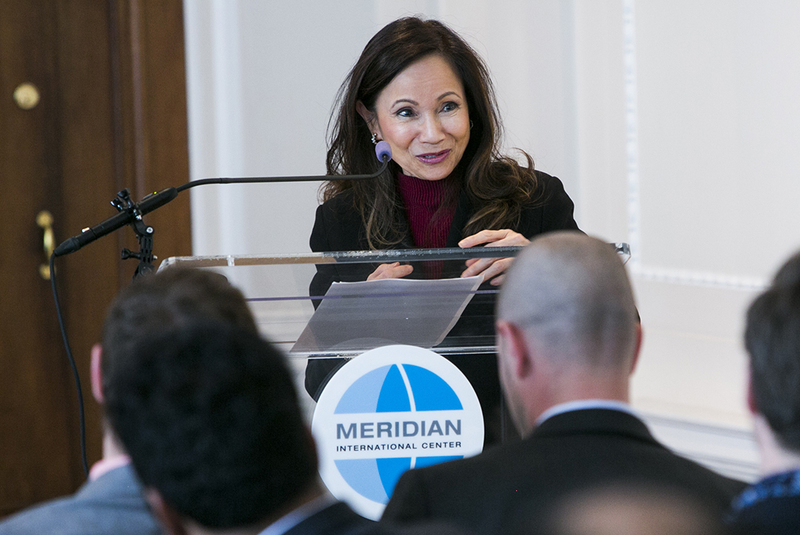 Through featured speakers and panels, Meridian cultivated an in-depth look at digital financial inclusion and international development. 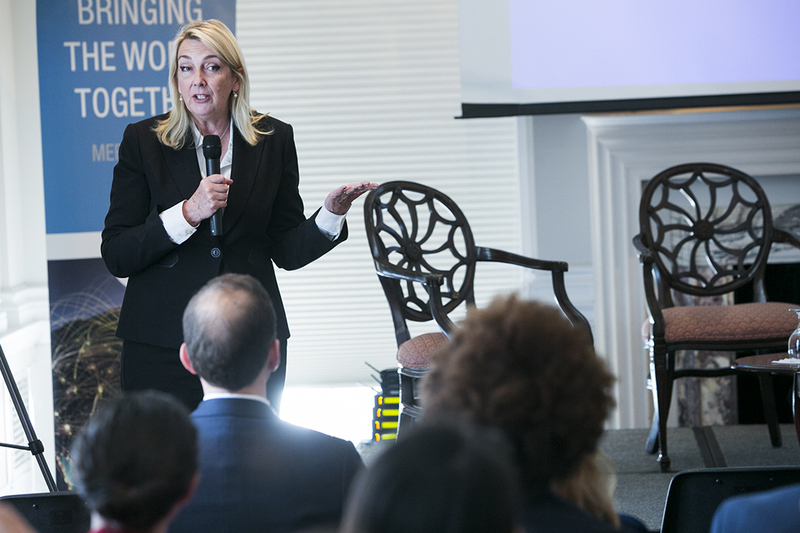 Together, we explored the role of technology in financial regulations, the customer experience with financial services, and the opportunity for U.S. leadership in advancing economic inclusion worldwide. Dr. Ruth Goodwin-Groen, Managing Director of the Better Than Cash Alliance, presents some of the opportunities for governments to digitize payments, such as increasing GDP, curbing leakage and corruption that comes with cash, and accelerating the FinTech industry for greater financial inclusion for all. Photo by Kristoffer Tripplaar. Kicking off the program, Dr. Ruth Goodwin-Groen, Managing Director of the Better Than Cash Alliance, drove home the importance of digital payments as a means to reduce poverty and drive inclusive growth worldwide. A United Nations based partnership of over 50 governments, companies and international organizations, the Better Than Cash Alliance has accelerated the transition from cash to digital payments through a number of initiatives – and helped many emerging markets and nations reap the benefits along the way. Illustrating some of the success stories, Dr. Goodwin-Groen focused on three numbers in particular: $500 million, $3 billion, and $3 trillion. In Tanzania, the digitization of Person-to-Government (P2G) and Business-to-Government (B2G) payments could increase Tanzania’s annual tax revenue by almost $500 million per year. The country’s tourism sector has already seen a 40 percent reduction of leakages from cash payments for services like conservation park entry fees. In the past two years, the Indian government has saved $3 billion by digitizing cash subsidies for cooking fuel – and bringing an end to “black-marketing” in the world’s largest cash transfer scheme. An earlier session of The Digital Finance Future also explored the benefits of digitizing and centralizing payments, specifically highlighting how the Central Bank of Mexico now saves $1.3 billion every year after making the change from cash to digital. The last figure Dr. Goodwin-Groen emphasized was $3 trillion – the amount in digital payments in 2016 facilitated via Chinese mobile apps Alipay and WeChat Pay. 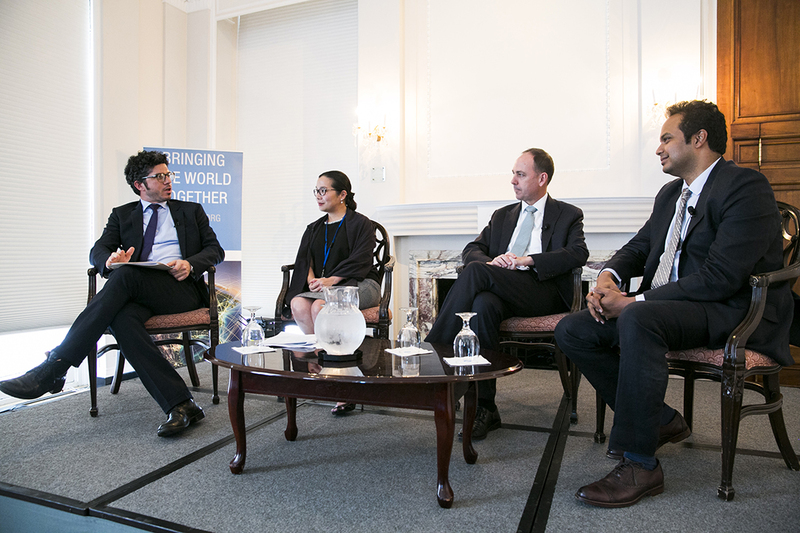 From left, Simone di Castri moderates a conversation on RegTech with R2A leaders Pia Roman, Head of Inclusive Finance Advocacy Staff at Bangko Sentral ng Pilipinas; Michael Wiegand, Director of Financial Services for the Poor at the Bill & Melinda Gates Foundation; and Kabir Kumar, Director of Policy and Ecosystem Building at Omidyar Network. Photo by Kristoffer Tripplaar. Building on this momentum, Simone di Castri, Director of Policy and Ecosystem Development of BFA, announced a new global initiative that leverages the innovative and transformative power of FinTech to help financial authorities improve regulatory oversight and policy development. With support from the Bill & Melinda Gates Foundation, Omidyar Network and USAID, RegTech for Regulators Accelerator – or R2A – is a program specifically aimed at designing RegTech solutions for financial authorities to keep pace as markets expand and become more technology-based. Three markets – the Philippines, Mexico and Ghana – have signed on thus far. To provide framing for the endeavor, USAID’s Acting Assistant Administrator for Asia, Gloria Steele, who was formerly Mission Director in the Philippines from 2010-2015, shared her first-hand experience of the challenges that Filipinos face in accessing a bank or government office in a country that has more than 7,000 islands. Assistant Administrator Steele emphasized how digital financial services play a vital role in bridging this gap, and they are also part of the larger strategy that supports the Philippines’ goal of increasing the share of e-payments from one percent in 2013, to 20 percent by 2020. Given the country’s digital leadership, the Philippines, as well as Mexico and Ghana, is well positioned to share learnings and best practices on RegTech with their peers. This is one of the benefits of R2A that panelists explored during the forum. Omidyar Network’s Kabir Kumar, the Philippines Central Bank’s Pia Roman, and Bill & Melinda Gates Foundation’s Michael Wigand, discussed how R2A’s cohort of tech experts and regulators would foster ongoing peer learning, and funders of the initiative would provide capital for prototyping innovative solutions. Possible applications include geo-mapping transactions and complaints to increase consumer protection as well as interactive tech to help financial regulators better understand customer needs. Kumar nodded to supportive institutions like the Bank of England, noting that “new players mean new ideas” in the digital finance arena. As more and more FinTech leaders increasingly view financial authorities as clients, and as financial authorities see tech startups as partners who can drive innovation and capacity building across finance policy and market regulation, RegTech will propel the future digital economy. Nadia van de Walle, Program Manager of Financial Inclusion Insights at InterMedia, leads an interactive presentation mapping the customer journey to economic inclusion. InterMedia’s Data Fiinder tool contains information on the financial experiences, behaviors, and barriers facing clients in order to help financial inclusion leaders design relevant interventions that address their demands and unmet needs. Photo by Kristoffer Tripplaar. Bringing the focus back to the end user of these new digital tools and financial services, Nadia van de Walle, Program Manager of Financial Inclusion Insights at InterMedia, led an interactive presentation mapping the customer journey. The Financial Inclusion Insights (FII) program underpins InterMedia’s effort to leverage data and information regarding the financial experiences, behaviors, and barriers facing clients along with their demands and unmet needs in order to design relevant interventions to improve their economic situation. Since 2013, InterMedia has conducted research on financial inclusion in eight countries in Africa and Asia with a combined population of over two billion. The informational collected is available for public use via InterMedia’s Data Fiinder tool, which can help financial inclusion champions further advance their efforts. To gain a deeper understanding of the data tool’s applications, van de Walle walked the audience through the five stages of the customer journey: Preconditions, the set of skills and resources necessary for progress on a specific type of financial account; Access & Trial, the use of a financial account; Registration, the point where individuals are counted as financially included for having an account at a full-service bank, mobile money or nonbank financial institution; Active Use, the transferring, saving or borrowing of money within 90 days; and Advanced Active Use, the additional account use for bill payment, merchant payment, receiving wages, and/or receiving government payments. Using the Data Fiinder, van de Walle demonstrated movement at each level. Testing for preconditions, she asked, “What percentage of people in Bangladesh own a mobile phone? How has this figure changed since 2013?” The Data Fiinder reveals the results – and compounds them further by layering data on gender over ownership data from 2013-2015. To test for customers in the Active Use phase, van de Walle asked, “Are programs targeting banking inclusion working in Kenya? Are gainfully employed users more likely to be active users?” The data revealed charts comparing active bank use within 90 days between Kenya’s employed and unemployed groups. Noting that the odds of advancing in the customer journey vary along a spectrum of key characteristics, perceptions, and behaviors, InterMedia’s found that having higher education is the strongest predictor followed by perceived ability to afford food. In Tanzania, higher perceived income corresponds with higher odds of owning a phone compared to respondents who perceive not having enough funds to afford food. In Uganda, high income has the strongest relationship with active mobile money use. Those who report the ability to afford expensive goods have 16 times higher odds of actively using mobile money than those with no money for food. 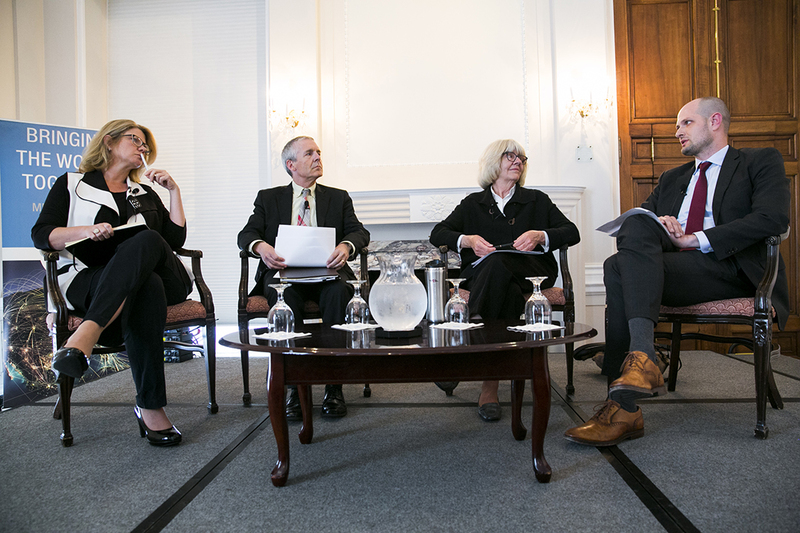 From left, Ida Rademacher, John Hurley, OPIC’s Mitchell Strauss and USAID’s Matt Homer discuss the various approaches that each U.S. government agency takes to financial inclusion. Photo by Kristoffer Tripplaar. The last segment of ‘The Digital Opportunity’ forum was a panel discussion on the role of the U.S. in advancing global financial inclusion. The Aspen Institute’s Ida Rademacher, who is Executive Director of the Financial Security Program, moderated a conversation with representatives from U.S. government, including Matt Homer, Senior Digital Finance Advisor at USAID’s Development Lab; John Hurley, Visiting Policy Fellow at the Center for Global Development and a former director at Treasury; and Mitchell Strauss, Special Advisor for Socially Responsible Investment Finance at OPIC. Rademacher opened the dialogue by stating that “financial inclusion is a means to an end … [that] can lead to many different things.” Financial inclusion has strong implications for the United States, particularly for government agencies to leverage as a tool for economic inclusion and development. In fact, four agencies – USAID, OPIC, State and Treasury – will soon welcome Digital Finance Fellows with expertise in FinTech, digital finance, and/or financial inclusion. Their purpose will be to help expand government capacity and advance policies and programs that create opportunities for unbanked and underbanked individuals across the globe; open new markets; improve efficiency; strengthen the U.S. economy and security; or help combat terrorism and crime. The fellowship was one initiative that the panel explored for how to better coordinate efforts across agencies in order to make consistent progress on meeting the needs of underserved people around the world. Specifically, the panel addressed why, what and how each government agency represented on the stage is already working to advance global financial inclusion. Focused on the macro-economic growth perspective, domestically and abroad, Treasury’s priorities are stability & security in the U.S. financial system – whose integrity and credibility is built on consumer trust. Hurley shared how Treasury is working in 8 countries to help establish regulatory frameworks that balances need to eliminate barriers to entry with consumer protection. Domestically, the agency chairs the Financial Literacy Economic Commission to promote more financial literacy programs across the country and thereby raise the profile of this economic issue. Internationally, the U.S. plays an influential role in groups like the G20 and the Financial Action Task Force (FATF), an inter-governmental body developing and promoting policies to combat money laundering and terrorist financing. 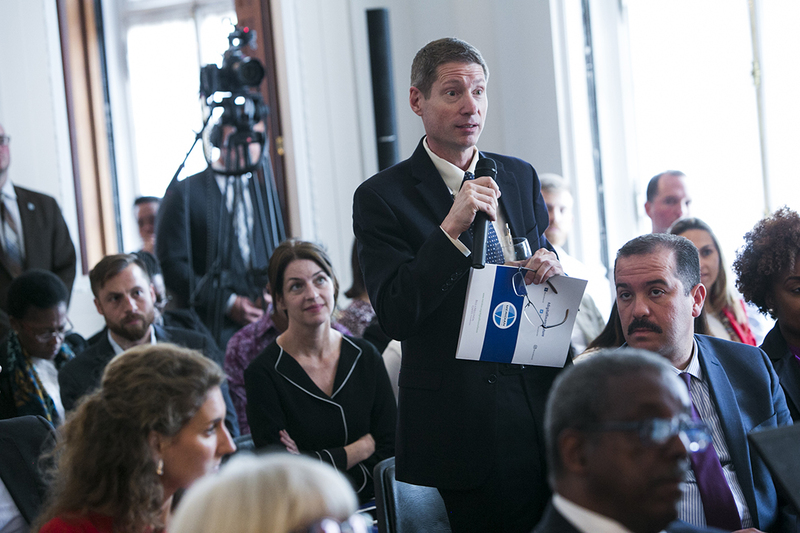 From OPIC’s perspective, Strauss explained how the agency – the only one funded by taxpayers – serves as a development finance institution to assist U.S. businesses working in developing nations. Pioneering microfinance investments 13 years ago, OPIC is now adding innovative software and tech on to its existing financial services to better engage farmers and individuals in rural areas in a wider host of economic activities, led by financial inclusion. Looking forward, OPIC’s goal is to leverage FinTech for equity and local interventions, and then scale up so any small business or banking intermediary can accelerate financial inclusion strategies into the larger digital finance ecosystem and increase global economic growth potential. Similarly, USAID views financial inclusion as a means to achieve its development objectives, and the work coming out of its Development Lab is proving how. As digital lowers the cost of reaching vulnerable populations, Homer said that USAID has been able to strengthen the agricultural sector by supporting more smallholder farmers as well as supplying more off-grid solar technology reliant on mobile money. Across all agencies, digital finance is opening up new opportunities for consumers and for businesses at home and abroad. 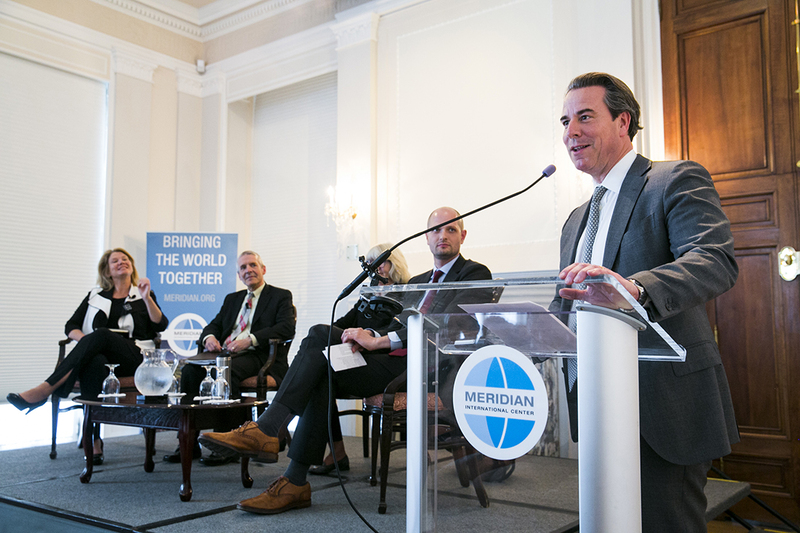 As the panel shared final thoughts on the vital role of the U.S. in bringing together people and organizations across sectors to examine critical global issues, Meridian’s President and CEO, Ambassador Stuart Holliday, came to the stage and echoed the value of convening in his closing remarks. Over the past several months, Meridian has brought together representatives from over 50 embassies into conversations on the opportunities that digital financial services afford to the underprivileged. These diplomats exchanged ideas and forged new relationships with fellow experts and influencers in government, business and nonprofit. This cross-sector approach will be vital as we work together to use the power of digital to bring more and more people into the financial system and pull them out of poverty. In his closing remarks, Ambassador Holliday thanks the audience for attending the forum and welcomes everyone for a reception in Meridian’s Linden Grove to celebrate The Digital Finance Future series. Photo by Kristoffer Tripplaar. Daniel Kauffman, a local realtor, asks the RegTech panel a question about the strategies to circumvent and overcome possible challenges for expanding innovation in the finance regulatory space. Photo by Kristoffer Tripplaar. Gloria Steele, Acting Assistant Administrator for Asia at USAID, shares first-hand accounts from her previous role as USAID’s Mission Director in the Philippines on the challenges that Filipinos face in accessing a bank or government office in a country comprised of more than 7,000 islands. Photo by Kristoffer Tripplaar. April 28, 2017The Digital Opportunity: Reducing Global Poverty through Economic Innovation – The Customer Journey to Financial Inclusion: What does the data reveal?